Not that I had a choice this year, and I could argue that every day should be Mother's Day, but here are my thoughts on what I'd like to eat on Mothering Sunday and my tummy is already grumbling. For Breakfast I would be happy to have some fluffy pancakes, served with copious amounts of crispy streaky bacon and maple syrup but my pancreas would probably disagree! 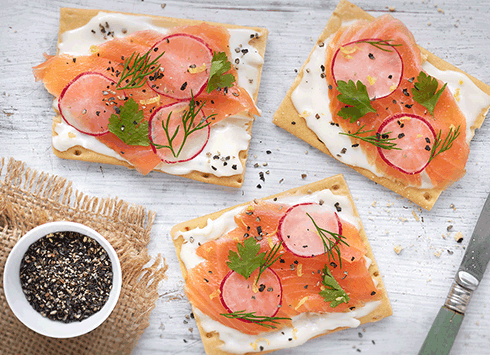 Alternatively I haven't had smoked salmon in a while, perhaps toasted wholemeal bagels topped with a smooth cheese such as Primula then the smoked salmon can be draped over the top of that with a little sprinkle of chopped dill. Sounds much more like a brunch and who know's when the kids will be ready to make me such a feast, but I can daydream, right? I know that I would enjoy this, as I found wholemeal toast and Primula cheese with avocado delicious. Lunch could be a pub lunch out in the New Forest; there are so many quaint villages we are yet to visit on micro-tourist adventures of the county we now call home. Alternatively, if for some reason the weather was fine, I'd be happy hopping on the ferry to the Isle of Wight and eat on the go whilst en route. Dinner could involve something sweet and fruity. Perhaps a pavlova piled high with whipped cream or dairy free ice cream with passion fruit coulis with extra drizzles on top. That isn't a bad idea, maybe I will make that for our combined Mothering Sunday lunch this weekend. The combination of fillings could be endless!